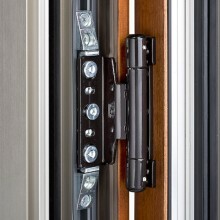 Inspired by the latest trends, SFS has introduced a complete programme of hinges for steel and aluminium doors. This range meets customer requirements for corrosion-resistance, extreme load bearing capacities, easy installation and adjustment, plus a wide range of colours and materials. 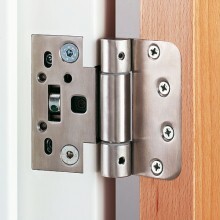 The Dynamic 2D-A hinge is suitable for aluminium doors. It brings the same features and benefits as all of its siblings plus a unique sash plate clamp system capable of a load capacity of 40kg per hinge. Available in a mill finish, this enables systems companies to match the hinge colour exactly to the door section for each project. Fit and forget! No need for remedial work on sagging doors. The fixed gasket pressure means weather sealing always remains exactly as preset in the factory so that on site installation errors are eliminated. A constant 4mm adjustment space means there is no need to adjust the top pin in relation to the bottom pin. Installation can be completed by a single operative. The Just 3D hinge is suitable for mounted doors with steel frames. In both public areas and in the home, flush mounting is “in”. That’s why we created a hinge with a particularly appealing aesthetic finish. The hinge is adjustable in all three directions: height, side angle and gasket pressure, using a single 4mm Allen key after hanging. Just 3D offers a guarantee of long term, trouble-free functionality. Self lubricating bushes ensure smooth, long term operation, verified when tested to EN 1935. Just 3D acheived a load rating of 100kg in this test. The Just 3D range also covers all-glass doors. The celebrated three-way adjustment potential which was a feature of the previous models has been retained. This hinge has been developed for 40 to 44 mm flush fitting doors. The Dynamic 3D hinge is characterised by its simple, aesthetically appealing design, ideal for house and patio-access doors and large area / French windows. The Dynamic 3D is fitted into the standard milled recess Eurogroove, and is ideal for plastic, wood and wood-aluminium designs. Alongside three-dimensional setting: +/- 2mm sideways, +/- 4mm in height and a minimum of +/- 1mm gasket pressure – depending on the position of the Eurogroove, this new, three-piece hinge guarantees increased stability. In addition, the three perfectly in-line sleeves underline the slim and elegant design of the Dynamic 3D.